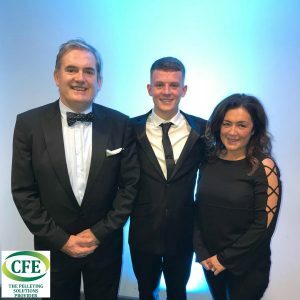 On Thursday 15th November CFE attended the Pride of St Helens Business Awards in association with Invest in St Helens at the Totally Wicked Stadium. The new event was an evening of celebration and glamour for the leading organisations who invested in St Helens during 2018. The awards celebrated the role of St Helens Businesses, Social Enterprises and School’s investment in raising the profile of St Helens as a place to invest, live, learn, visit and work, via nurturing aspirations, pride, creating inspiration, job and wealth creation. The award team recognises that all businesses participate and contribute to St Helens economy and future opportunities. These business awards celebrate and tell stories, far and wide, of businesses contribution to St Helens. If every business strives to be a responsible business and promotes a pride in place, there will be a positive multiplier effect that will benefit St Helens economy and its residents. Of the award 11 categories, CFE was nominated for the Small Business of the Year award sponsored by DC&A Financial Planning. CFE were finalists for the sub-category of businesses employing between 10-49 employees. Representing CFE at the award ceremony were Con Lynch, Curtis Ashcroft and Hayley Langshaw.